Woop woop! Another amazing rendition of a box cake mix. The recipe I followed was called Chess Squares, but they�re also known as Gooey Butter Squares by Paula Deen. I�m going to call them Chess Squares because Gooey Butter Squares just sounds like a two-bite heart attack. 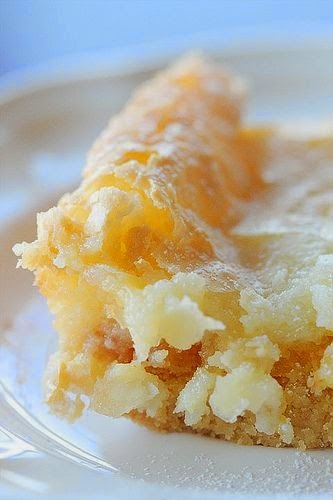 The recipe, thanks to Kevin & Amanda�s blog, talks about how they wanted to originally try making something called �Crack Pie� (I hope to try this one day! ), a dessert from Momofuku Milk Bar in New York. They were turned off from trying it because of the 22 ingredients and almost 2+ hour prep time! Thank goodness they shared this quick version!